14 icons including titanium display & AirPort. Is there a better alternative to Pixel : Pop v.3? Is Pixel : Pop v.3 really the best app in Icons category? Will Pixel : Pop v.3 work good on macOS 10.13.4? 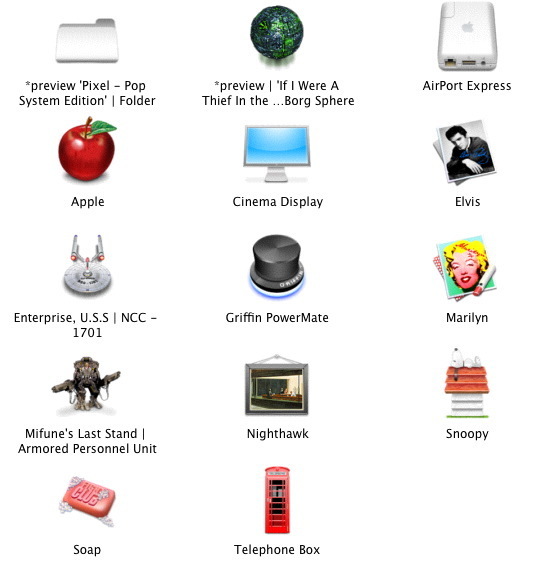 Pixel : Pop v.3 is a set of 14 very random icons that include the wall socket AirPort Express base station, the titanium flat panel display, the Griffin iMate, Snoopy, Elvis and more. Pixel : Pop v.3 needs a rating. Be the first to rate this app and get the discussion started!